The world of home theater furnishings has a number of luxury brand options. Many will push the price of furniture into a category that is significantly above mid-market brands like Palliser and Berkline. These brands mostly offer luxurious custom options such as premium Scandinavian leathers, or customized seating built exactly to the users dimensions. Their features and benefits are great - if you can afford them - but this portion of the market is competitive, and has not really offered anything original for many years. Human Touch is a brand that offers options in the upper end of the home theater furniture spectrum that are ground breaking. Their recliners are not only original and notable style icons, but bring benefits to the table that are not seen from anyone. Their perfect chair recliners are zero gravity recliners that include a modern and clean design that will prove to be a work of art in any home theater room. Zero gravity means the seat and foot rest recline backwards to a position which relieves the constant pressure one feels from the earth's continuous gravitational pull on our bodies. 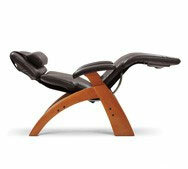 Fully reclined, one's feet sit higher than one's head - a heart conscious and healthy posture to relax in. Fine craftsmanship and attention to the smallest details, complete a product that is known for its quality and respected by its peers. TheaterSeatStore is proud to offer this great brand of seating, along with all its models for purchase from January 2011.